Haven’t decided on a hotel yet? You can look at other available hotels in Sicily with Booking.com. If you are interested in staying in a Sicilian villa, Booking.com offers a number of stunning properties. The largest island in the Mediterranean, Sicily is also Italy’s largest region and its most diverse. You can’t help but notice a different feel in the air as you arrive from the mainland. Sunlight streams over endless coastline, rugged mountains, wheatfields, and citrus, palm, and olive groves. Mt. Etna, Europe’s highest and one of its most active volcanoes, looms above. Sicily’s strategic position has invited a long line of invaders—Greek, Byzantine, Arab, Norman, French, and Spanish—who have all left an indelible impression on the island’s culture, its architecture and cuisine. Intriguing, ancient temples and castles stand proudly throughout the island, and are open for all to explore. Splendid Greek ruins will keep the classicists among you busy for months. Among the most noble of the Greek ruins are: Selinunte has ancient ruins galore! From the 7th to the 5th centuries B.C. Selinunte was one of the most powerful cities in the world until destroyed by the Carthagineans. It now the largest archaeological park in Europe. Doric columns and temples lie scattered across a plateau overlooking the sea, scarcely touched since ancient times. Agrigento hosts some of the greatest Doric temples and Greek ruins in the world in the Valley of the Temples (Valle dei Templi). Segesta Dating from the 5th century B.C., this Doric temple stands alone along a mountain cleft and is in a superb state of preservation. Syracuse Although Syracuse has declined over the millennia, Cicero once declared its beauty was only rivaled by that of Athens. Wonderful archaeological treasures still abound. The Parco Archeologico della Neapolis features the 5th-century masterpiece of classical architecture: the Teatro Greco. During the apex of its glory, it could seat 16,000 people and Greek tragedian Aeschylus attended performances of his plays here. Nearby is one of the better Roman amphitheaters in existence: the Anfiteatro Romano. And not far away, too, is the Latomia del Paradiso (Paradise Quarry) from where workers hauled stones to build Syracuse’s great monuments. Take the bridge over to the island of Ortigia, where the Greek past is evident in every direction. The Tempio de Athena now forms the foundation of the Duomo (cathedral); the Fontana Aretusa, a freshwater spring with origins deep in Greek mythology, is a romantic spot to linger and dream. Classicists won’t want to miss the Museo Archeologico Paolo Orsi, which boasts one of the most extensive archaeological collections in Europe. Taormina Sicily’s most famous and glamorous resort has attracted Europe’s writers and artists, Hollywood’s golden age stars, and generally anybody rich and famous for well over 100 years. Even the inevitable overdevelopment has not spoiled this town’s splendid beauty. It’s medieval character still charms; the bougainvillea cascades over the walls; and snowcapped Mt Etna majestically rises against an azure sky. 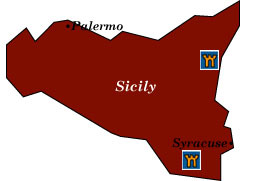 The castles of Sicily With 1000s of years worth of invading forces, Sicily has dozens of glorious castles to explore. Among the most interesting are: Caccamo, Castello di Venere, and Castello di Lombardia. Palermo Despite its reputation for traffic, crime, and crowding, Palermo can boast of owning Sicily’s most magnificent architecture. Start with the Palazzo dei Normanni. With Arab origins, the Normans restored the palace into a splendid residence. Its Capella Palatina is adorned with exquisite Byzantine mosaics. The San Giovanni degli Eremiti is Palermo’s most identifiable church and Norman monument. The Galleria Regionale di Abatellis is a don’t-miss museum filled with paintings and sculptures representing 500 years of Sicily’s art history. Monreale The outstanding 12th-century mosaics inside the Duomo portray the complete cycle of the Old and New Testaments.